A couple of weeks ago I drove westbound on Rancho California Road in Temecula, getting ready to turn left onto the I-15 southbound, when BAAAAMMM I was hit from the right. An SUV had tried to cross into my lane, apparently didn’t see me, and tore up the entire right side of my Prius, from the front bumper, through both right doors, the rear fender and the rear bumper. I have never before been hit like that. I pulled over to the right side, and the car that hit me followed. It turns out the driver was a 15-year-old girl who was out on a practice ride with her mother two days before she was scheduled to take the test to get her driver’s license. The poor girl was upset. While we waited for the police to come, we exchanged information, taking pictures of each other’s driver’s licenses, registrations and insurance cards. When the police finally came, the officer didn’t actually do anything, since there were no injuries involved. He gave us each his card with the ticket number on it, and told us that we should both contact our insurance companies and they would work out the details. I was depressed all the way home. I didn’t want to have to deal with getting the car fixed. It didn’t look like it would be cheap. The wheel was hit, and the entire right side of my car was scraped. The door didn’t open. The mirror was bent. When I got home, I needed a break. I sat down at the TV and watched the depressing evening news. But I calmed down. At around 8:00pm I went to my desk and pulled up my insurance policy with 21st Century Insurance. It was time to call this incident in. Just as I was getting started I received a call from Geico, the insurance company of the car that hit me. The agent first asked me whether I was ok, hurt in any way, and whether my car was drivable. I told him it was a bit wobbly at high speeds, since the wheel was hit, but I was able to take it home. He asked me to describe what had happened, and I did. Then he told me that they would take full responsibility for getting my car repaired, and they would provide a rental car in the meantime. He was ok with me calling my own insurance company, but he didn’t think it was necessary, since they’d take care of the problem. The gave me a phone number to call in the morning to take my car in. The next morning, I called the number, and they told me to take the car to Henson’s Fix Auto, a shop in Escondido, not more than a mile from my office. I made an appointment at 10:30am. When I walked into the lobby, there were three people there. The first person got up and introduced himself as the Geico representative. He’d take care of my problem. Then he introduced me to the lady at the other desk, who worked for Henson’s shop. She’d get the work done. And the other gentleman was a representative from Enterprise Rent-a-car, who was here with my car. The man from Geico looked over my car with me and explained all that he saw and that they were going to do. Then he led me back into the office, and the lady from the shop gave me all the paperwork. The man from Enterprise handed me the key to the blue car he had brought for me and checked me into the car. I was out of there within less than 30 minutes. It was the most pleasant, helpful and efficient customer service experience I can remember. Something as traumatic and upsetting as a trashed car was made easy and comfortable. The next day Geico called me with the cost of $4,800 and assured me that Geico was taking responsibility. It would take two weeks to get the car fixed. He said he’d call Enterprise and tell them how long I’d need the rental car. Every day in the last two weeks I received text messages updating me about the status of the repairs and that all was well. Today I received the call that it was done and I could pick it up. I drove back, gave them the key to the rental car, checked out the repairs – looks beautiful – and drove away. Geico has the most impressive customer service I have ever experienced. 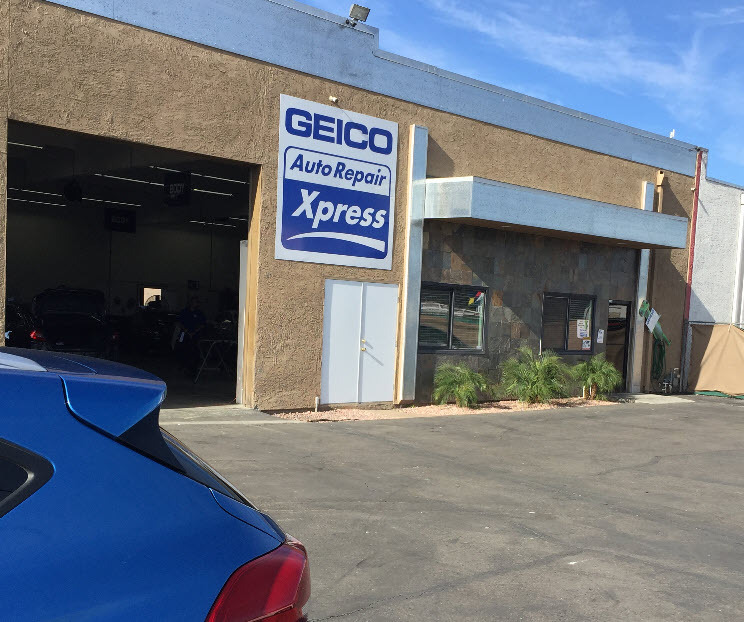 Henson’s Fix Auto shop does customer service like it should be done in the digital age. And Enterprise supplied me with a hassle-free car. I hope the 15-year-old girl learned a valuable lesson about traffic from this and I hope she got her license. I remember the day many years ago when my own son totaled his first car, and how relieved I was that he was ok. He learned. We all want our kids to grow up alright, safe and responsible. And this family did the responsible thing and took care of this for me as effortlessly as it could be done. And now I think I need to switch to Geico. So glad you weren’t hurt but I’d go to a chiropractor to check out your neck/back. sideways hits are bad.